The murders are alleged to have happened during the summer months. 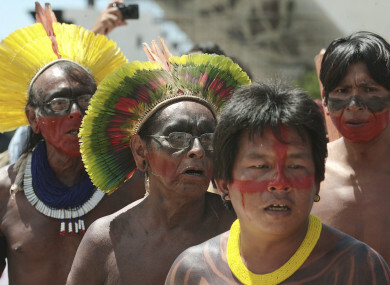 Indigenous leaders gathered in Brasilia in 2012 to ask for the suspension of construction of the hydroelectric plant. POLICE IN BRAZIL are investigating the alleged massacre of several indigenous people from an uncontacted Amazonian tribe by illegal miners in northwestern Brazil. Prosecutors told Amazonia Real that federal police and the public prosecutor’s office were investigating the killings of an unspecified number of indigenous people reportedly killed in August in the Sao Paulo municipality of Olivenca, on the border with Peru and Colombia. Although the report did not confirm the death toll, suspects or weapons used, it cited other indigenous people as saying up to 20 tribal members were killed. Prosecutors are also investigating another complaint about the alleged killing of indigenous people from the isolated Warikama Djapar tribe. The attack would have occurred in May but has not been confirmed. Both killings would have taken place on the Vale do Javari indigenous land that lies in an area of about 8.5 million hectares (21 million acres), about 1,200 kilometres from Manaus, capital of Amazonas state. According to the National Indian Foundation (FUNAI), there are at least 14 references to isolated indigenous peoples in the area. Indigenous leader Adelson Kora Kanamari said in an interview with the Amazon Real portal that between 18 and 21 indigenous people “have been attacked and killed”. “If these stories are confirmed, President Temer and his government bear a heavy responsibility for this genocidal attack,” Kanamari said. The killings were also denounced by Survival International, which said the killings allegedly took place last month but only came to light after goldminers had boasted of the killings. It said two goldminers had been arrested. Survival also condemned budget cuts to FUNAI. All these tribes should have had their lands properly recognized and protected years ago. The government’s open support for those who want to open up indigenous territories is utterly shameful, and is setting indigenous rights in Brazil back decades. A court order last week blocked a decree signed by Temer to open up a huge area of the Amazonian rainforest to large-scale mining. Speaking to Amazonia Real, Kanamari explained that the situation in the region is “very critical”. “The invaders are landowners, hunters, miners. Many (indigenous) are being killed in isolation, but we don’t know the exact dates or number of deaths,” he said. Temer’s government has come in for international criticism after rowing back on environmental and indigenous rights issues amid an economic crisis. Email “Brazil investigates alleged massacre of Amazonian tribe by gold prospectors”. Feedback on “Brazil investigates alleged massacre of Amazonian tribe by gold prospectors”.